Derbyshire appear to be on the cusp of something unusual - a place in the Quarter Finals of the Friends Life T20 competition! The top two of the three groups automatically qualify for the next stage and the best two third place sides from the three groups will also go through. 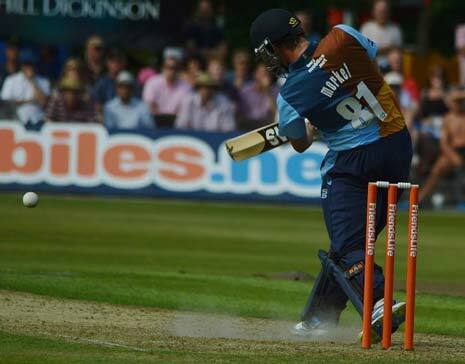 Derbyshire have only once made the last eight when they faced a Lancashire side who dominated with the bat, Mal Loye smashing 73 off just 32 balls and Andrew Symonds with 57 not out off 37 balls. Despite a 41 from Michael Di Venuto, Derbyshire fell 17 runs short. It has to date, been Derbyshire's only appearance at the Quarter Final stage. The Falcons beat the much fancied Nottinghamshire Outlaws on Tuesday night, and need to win their last two games starting with Leicestershire Foxes tonight (Friday 26th July) and at Durham Dynamos on Sunday 28th July. 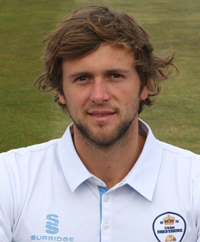 Derbyshire will be without Albie Morkel (above) who has gone to play in the Carribean Premier League for St Lucia Zouks which kicks off on the 30th July, plus it's likely that Shivnarine Chanderpaul will still be missing with a hamstring injury picked up at Old Trafford on the 12th July. Derbyshire defeated Leicestershire earlier in the competition and with Lancashire playing Nottinghamshire in their last match, the Falcons will be hoping to try and sneak into a second place spot. Match starts this evening (Friday 26th July) at 7pm. And news of an out for Derbyshire CCC, as all-rounder Ross Whiteley (left) leaves the Club by mutual consent to join Worcestershire CCC. Head Coach Karl Krikken said: "Ross intends to pursue his career during the winter in Australia, a move which does not fit in with our plans for a full winter pre-season with Derbyshire. "While we are disappointed to lose Ross, we have sufficient quality in the squad to make up for his departure and we wish him well in his future endeavours." Simon Storey, Chief Executive, said: "In the light of Ross' request to be released from his contract, the Board has agreed that it would be in the best interests of Club and player that he leaves and a deal has been agreed for his immediate move to New Road."